Let’s continue with more accessories to widen even more the potentialities of our Forgotten Halls project. Let’s start from the terrace that we did present during last article. We did add 2 towers to this structure, connected between them with a small overhead bridge. You can see how the stairs give a great dynamism to the whole, while the towers give a robust show of strength to the whole structure. On this other building, we modified everything making it a real sturdy fortress. The 2 towers are still there but we took out the stairs bringing up to the terrace, and made the walls of the main building much more sturdier thanks to our “Dynamic External Walls”. And this is just a single floor building. Imagine what you could create with a taller structure, with more floors … a unique and huge fortress. Let’s speak about our “Dynamic External Walls”. This simple yet elegant MHW idea allows to create endless potentialities for your building creations, without needing to invest a lot of money to buy hundreds of different walls, which then take also a lot of place when you need to stock them around. With our solution, with just the Walls of our Base Set, you can add any kind of our Dynamic External Walls to create a various number of different walls of your liking. We’re just scratching the surface here of the possibilities, since you can combine the main Dynamic Walls (inside the walls) with the External ones to create wonderful results, giving depth and details, in different ways, to your structure. Of course, our external dynamic walls are available on both format (60x56x4mm. 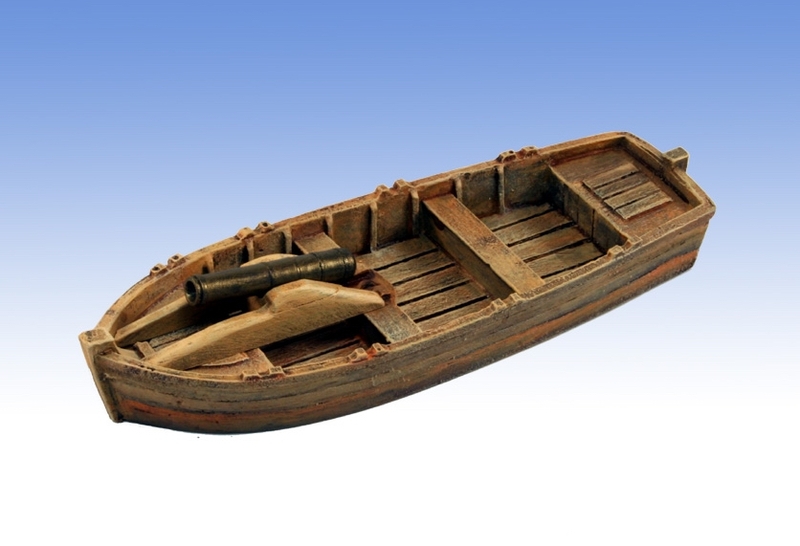 and 100x56x4mm.). Let’s start the 2017 by presenting how our 3D Bases work with our Forgotten Halls project. The 3D Bases are prefect to create a gaming area where to build the Forgotten Halls structures. Today we are showing you the Stone Slabs. Like their name say, those represent stone slabs of 25x25mm. They are ideal for any RPG, boardgame, skirmish or other which use a grid area to move. In the last article we showed you how the walls of FH can be detached from the floors and used on their own. This is all good, but where to use these walls ? The short answer is : anywhere is good. As you can see for yourself in these images, the overall result together is just perfect. But it doesn’t stop here. Our FH project will continue to present new tools and options. Let’s speak about the latest add-on, which adds a great touch to our Floor set. Our new floor measures 100x100x2mm and will allow you to create ample floors fully playable. Also, all of our floors can be fully removed from the walls, allowing you to play and reach any floor underneath. 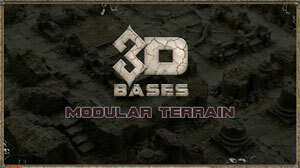 This is just the first article which will speak of the synergy between our 2 project 3D Bases and Forgotten Halls. In the next one, you will see how our Upper Floors can be used to create new structures, even on the ground floor. As promised here is an update about production! Images speak more than a thousand words, so here you will see finally some battlegrounds composed of 24 bases (120x180cm), in various set-ups as to show how versatile the whole product is! 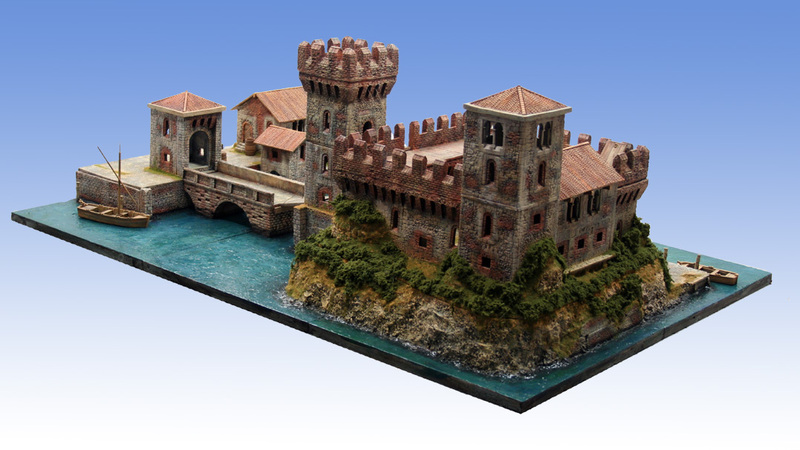 Now the production factory is fully focused on the Abbey bases, the most complex bases of all, and affirms the production will be finished in January. The Abbey bases are surely the most interesting ones, since nearly all you chose to buy a copy of them. As we wrote before, however, the deliveries will start once we have some Abbeys ready, so hopefully the first deliveries will be on their way before the end of January! In the meantime, what you see on the images are the bases that will be delivered to an Australian backer, with some other material / product from our first crowdfunding. The backer had to wait quite a while to receive our material from our first crowdfundung, but we learned a lot on for this Kickstarter, where he will receive everything 3 months in advance! This is what we hope will be our policy from now on, and a thank you gesture for his patience! Let’s finish with the best Christmas wishes for all. We are at the end of 2016, which was for us a great year, and we’re sure 2017 will be even better. So a big THANK YOU for all your support which allowed us to end this year so well. A very great Christmas and best wishes for 2017 to all of you and your families, from David and me. Update #9 – Hard Plastic – Forgotten Halls without floors ? Today we show to you yet another great characteristic of FH, along with a new series of accessories which are part of FH. As you can see in the video and in the pictures, it is possible to create and build walls and structures without needing to put them on top of our FH floors. Indeed, you can see there is nothing under our walls here. This is an important part of our project and its modularity and versatility. 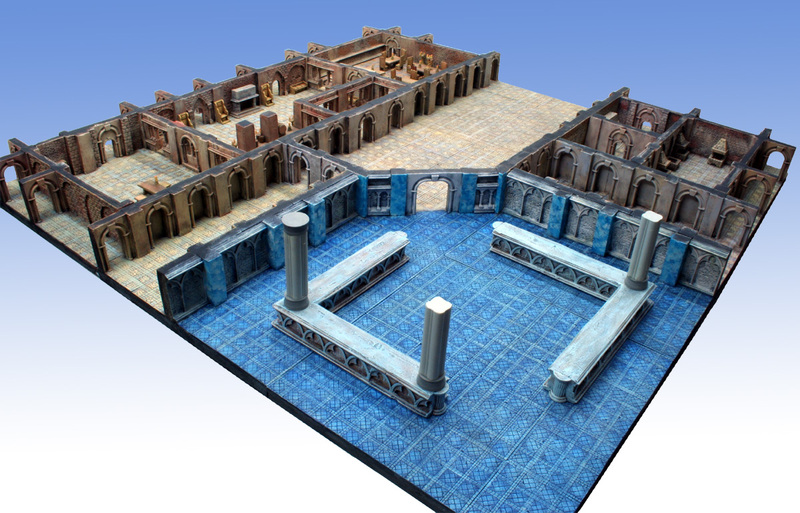 You can build up your dungeon, castle or other structure without being forced to used our modular dynamic FH floors. 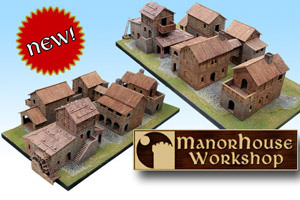 Well, maybe you would want to use our walls and buildings on your own gaming table / terrain, or you might wish to use them on top of some of the many gaming mats which are on sale nowadays, or you could wish to use them on top of our 3D Bases tiles, which are perfect in combination with our FH structures (you’ll see more of it in a future update). But today, we really wanted to show you that our FH structures can be put anywhere, without needing to do any modifications to a gaming table terrain. The balconies and small pillars on top of the roof, which form a nice architectural result and can be used in a lot of different ways to add ornaments on top of them (like statues, gargoyles, etc.). These small pillars will have inserts on all sides (even of top and bottom) which will allow them to connect and fix the balconies, the covers, etc, and also to the many other accessories like torches, half-columns, or other ornamental pieces that will be developed. These new accessories will allow to add a lot more detail and amazing versatility to your FH structures. Now it’s time to get more into details about our innovative F.H. Stairs. At Manorhouse Workshop, we give you the possibility to have both in 1 Stairs product. Our Stairs can switch from one version to the other, just by turning upside-down the steps. In other words, from our Realistic Stairs version, if you just turn the steps of the Stairs upside down, a slit of 5mm high will appear between the steps, allowing you to insert with ease most miniature bases inside, which will then stick there without moving, creating thus the Gaming Stairs version of our Stairs. If you want to go back to the Realistic version, just rotate the steps back again! 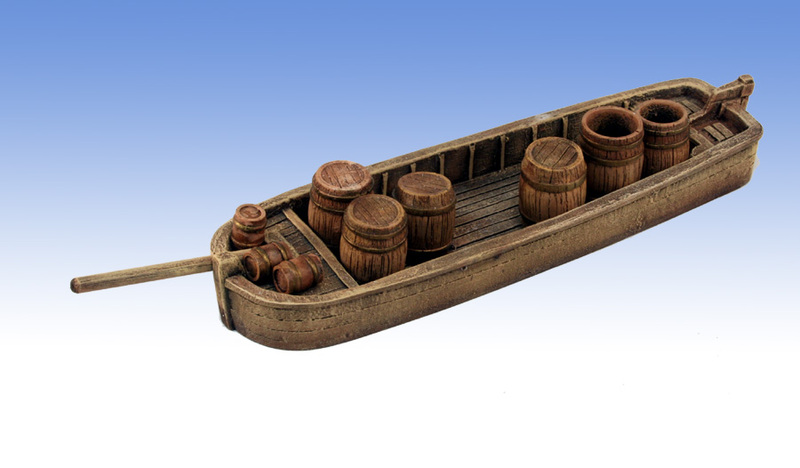 Manorhouse Workshop always aims at creating the best looking version for all its products, even on more Gaming versions. We are quite sure that if we didn’t write about it, you wouldn’t have recognized that the one of the Stairs was built on a Gaming version. With this innovative “2 in 1” solution, created by MHW, we are positive to satisfy the needs of both Gamers and Diorama perfectionists. 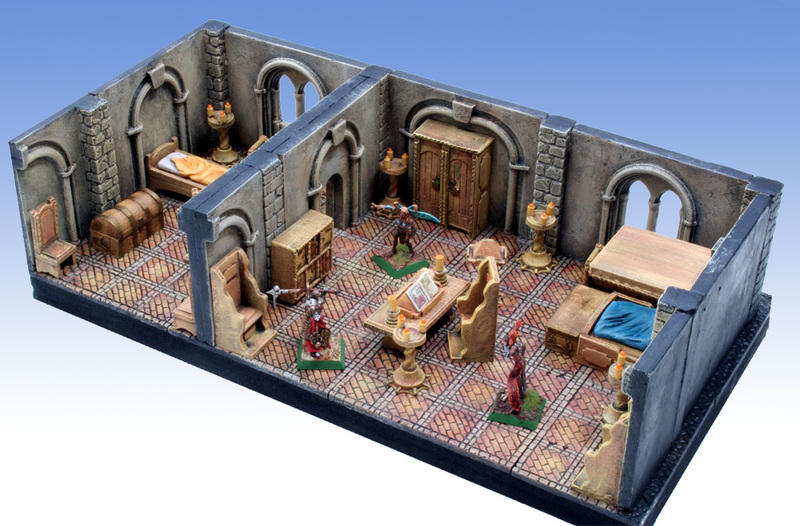 Update #6 – Hard Plastic -Flooring up & Zealot Miniatures!!! We’ve shown you up to now videos about walls, floors, modularity, inserts, and compatibility. But what about getting higher ? What about adding floors for a multi-level dungeon or gaming area ? This is where it gets even more interesting! You can also see a balcony, but more especially, our Upper Floors. Our system of Upper Floors allow you to take them out very easily to be able to keep playing on the lower floors, without having to detach and unbuild all your walls and floors. It’s playability to its finest, and we wouldn’t set up for less. And what about the torches ? Will they be available in our Kickstarter ? Those are actually Zealot Miniatures torches. This company launched a great Kickstarter and has great quality add-ons to fill any building or dungeon. Their 3D level work is amazing, and who knows, maybe they’ll be designing the Forgotten Halls add-ons and inserts ? The holes in our pillars/walls can be used to insert anything. Torches and columns is just the start. We have many other surprises in store. What about indeed Steampunk, Ruins, or Post-Apocaliptic inserts ? We have already developed them. They will be waiting for you in our Kickstarter. Regards from Lorenzo and David. When MHW first created the concept of dynamic walls some years ago, it was the result of years of brainstorming. Something simple, yet elegant. Dynamic Walls are called like that because they can be inserted and swapped into our real walls to create an infinity of combinations. This means you don’t need to buy a lot of different walls. You need usually to buy only 1, and if you want to have different walls, just swap the insert (“Dynamic Wall”) inside, and you’re good. Here is a short video about 6 different dynamic walls that we have created, and which will be available for our Kickstarter. Did you notice also our dynamic wall with the door ? Yes, the door is open there, but not fixed. All our doors, in our dynamic walls, will be able to be opened and closed easily, allowing you to open passages without having to take out the dynamic wall in itself! It doesn’t stop to wooden doors. A good number of our dynamic walls can have such a feature, it’s quite simple, really. What are our 6 dynamic walls ? Plain wall: the overall result is a very gothic-like plain wall. Door: you can open and close this door without having to swap the dynamic wall. It is very important when you have another floor/wall on top of it, else you would need to unbuild a whole upper floor section just to take out the dynamic wall so as to “open” the door. Grate: very straightforward. Can also be created with a “door grate” version, similar to our “Door” dynamic wall, for more versatility. Window & Gothic Balcony: those versions aren’t seen in other videos yet, but they are a sneak peek of what to come. They will allow you to have breathtaking upper floors, in full gothic architecture, starting from balconies, and moving to whole structures and churches/cathedrals. First of all, it’s beautiful, and brings out the full power of the gothic architecture. We love beautiful things. Secondly, while you can keep a walled arch without a dynamic wall inside (and it would just show an arch), if you don’t add a cover or a dynamic wall inside, then it won’t look perfect overall, because you will see the slit/slot on the top of the wall, empty, like a hole, because there is no dynamic wall inside. The same slits could be seen also from the inside, if you look closely at the insides of the arches. We at MHW aim for perfection. Does it stop there ? There are many more to come, and all of our dynamic walls have been thought so as to be used in a plethora of different situations, making them the most modular (and useful) walls you’ll ever see. 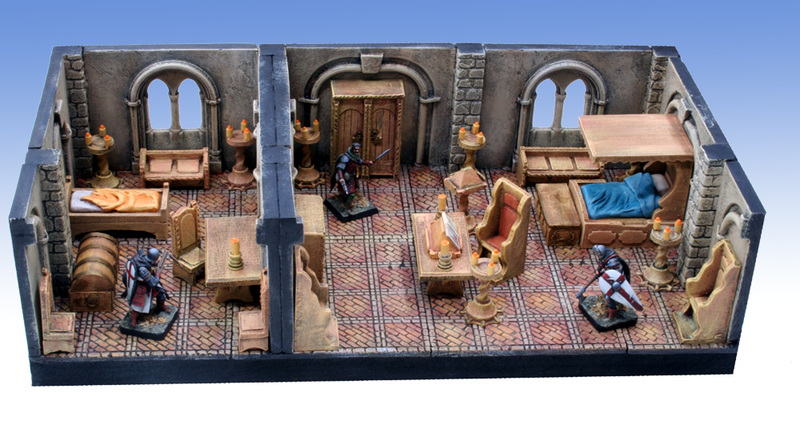 In all our projects, we always show videos and images on how they are compatible with Dwarven Forge, another great product which showed its worth throughout the years. We are using the caverns of Dwarven Forge for actually showing how well painted terrains from both companies look very great (and fit perfectly) together! In this video, you see how the caverns, filled with water, reach a building subterranean structure, with an underground sewer entrance .. The same pieces of Forgotten Halls, in our second video, have been reassembled in a different pattern to create not anymore a big room, but a long corridor . Again, you can see that from an entrance, the corridor follows a long and tortuous path, where a Marilith (D&D demon) blocks the way, up to a more and more foggy corridor which reaches into the sewer area, where all Dwarven Forge pieces connect and blend perfectly.